As a parent, the welfare of your babies should be your uttermost concern. Feeding babies can be a very messy task at times as babies tend to play around with their foods instead of eating it. Baby bibs are helpful as they minimize the possibility of babies soiling their clothes with food while eating. Using a baby bib saves you enough time and stress in your next cloth washing session. I choose silicone baby bibs as the best because silicone as a material has very low toxicity and high heat resistance. Going to shops or online stores to pick the best silicone baby bibs to buy? You will be presented with a large range of choices as these silicone baby bibs are available in various sizes and styles which can get you confused. This article is here to save you the stress. We have outlined the best silicone baby bibs on the market. 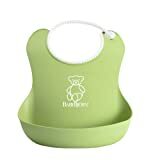 Bjorn is a popular kitchen and baby products producing company; the Baby Bjorn Soft Bib is a very nice Baby bib that will be of good use to you and your baby as well. It can be used for Babies of 4 months and above, it is a soft material so it will be comfortable resting around your baby’s neck.It has a deep spill pocket that prevents drops of food from touching the floor.The neckband is adjustable and thus can be easily adjusted as your baby keeps growing till they no longer need a baby bib.It is also easy to clean as well. You can depend on this Explora Easi-Roll Bib to keep your baby clean during mealtimes; it is for babies from 7 months and above and it is made to be very soft and light weight. Just like the name “Easi-Roll” the Tommee Tippee Explora Easi-Roll Bib can be easily rolled up making it very easy to store and convenient to carry around too. If your baby has a delicate skin, it has a dimpled reverse that prevents irritation.It also has a crumb catcher that stops food crumbs from reaching the floor. This baby bib is available in different colors; you just need to make your choice. This is another exceptional baby bib stunning baby big produced by OXO. It is a very soft bib and has features a wide food-safe pocket.The OXO Tot Roll-Up Bib prevents accidentally spillage of food on the baby’s clothing and on the floor as well.It is travel friendly as it can be easily rolled up;it is also adjustable and can last for a very long while. I really love the size of this bib, it is not too big and not small either, it is very lightweight and won’t be a burden for your baby, it can be used for babies of 3 months and above. This baby bib is one of the top most used baby bibs out there. This bib is made of Waterproof silicone and it is very soft providing no sort of discomfort to your baby. It comes in different bright and attractive colors sure to entice your kids. It has a button like the clip at the back which is adjustable and can hold firm until the meal is over. The wide stay-open pocket prevents foods from dripping to the floor. It is easy to clean, you can either wipe it with a damp cloth or you rinse it under a sink. Just as the name implies, using this baby bib will make you happy. Made from 100% natural silicone, the Ulubulu silicone bib is a product that has been tested and confirmed to be reliable. It has a very attractive design though some think the design is funny because it is normally designed with faces of funny animals. It has an inbuilt crumb catcher with an adjustable clasp and it can be easily rolled up for storage and travel purposes. It is ok to recommended used for babies of 6 months and below, but I think you can even use it for a 4 months old baby as it is a very lightweight bib. The NatureBond Waterproof Silicone baby bib is one baby bib to pick when talking about monetary value. It is cheap but of very high quality. It has a waterproof pouch that prevents your baby’s clothes from getting soiled by food stains or liquid spillage. No matter how babies try, they can never take it off their neck as this baby bib comes with four tightening buttons, once fixed, it doesn’t go off until it is being removed. 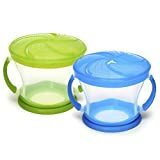 It is BPA and PVC free and comes with appealing colors that attract babies it has been reviewed by many customers to be durable. This baby bib is a perfect baby bib to help you make your babies eat in without dirtying the whole place. It is made with waterproof silicone and is very soft and medium weighted. It has a wide food catcher pocket with a bend that helps keep food stains off your baby clothes and also directs them into the pocket; it catches almost everything that drops. Your baby can’t rip it off while eating either and you can just throw them into the dishwasher when done to clean them up. This baby bib is easy to put on and take off and it can be used both indoors and outdoors. You can save yourself money by getting this cheap and very reliable baby bib, it comes in a set of two, you get double quality for one very cheap price. It is very soft, flexible and it provides less irritation to baby skins. The catcher pocket is wide and open to catch all dropping food particles from your baby’s mouth. It can be easily cleaned by wiping it or running it under the sink whilst flipping it inside and out. There are four buttons to hook at the back and if your baby is the type that likes to pull off stuffs, this will surely provide a competition he/she can’t win. Using this silicone baby bib is one sure way of getting rid of food stains on your baby’s cloths once and for all. Weesprouts’ produces some of the best baby products out there in the market and this baby bib is no different, on. It can be easily adjustable to match the size of your baby’s neck and has a large stay-open pocket. This baby bib has been approved by the FDA to be BPA and PVC free making it safe for daily contact with your baby’s skin. It is made of soft and flexible silicone just like every other silicone baby bib, it is relatively easy to clean. Last here is the Kiddo Feedo, a nice bib I must say with a very high quality. It comes with unique color designs – Blue, Gray, Orange, Pink, Purple and Yellow – and it is also soft, lightweight and easy to clean. This baby bib is waterproof and cannot be easily ripped off by babies; the bib pocket is wide and all dropping food particles fall inside. It can be rolled up making it very easy storage at homes and also very portable for carrying around. The strap is adjustable and it is ideal for babies from 6 months and above. Is the bib easy to put on? Yes, the above-listed baby bibs are easy to put on, no stress of any kind will be encountered when trying to put them on your baby. How do I clean my Baby Bib? Cleaning a silicone baby bib is no work, you can choose to wipe the bib with a damp cloth or rinse it in a sink and dry. It is easy to clean. What ages are the bibs intended for? Generally, Baby bibs are intended for kids between the ages of 3 months to 30 months. How long will the baby bibs last? Quality baby bibs are sure to last for over 5 years, it solely depends on how you use them. Baby bibs are important for growing babies, every baby needs one. As a parent, if you are looking for the best silicone baby bibs to buy pick any one of your taste from our list and be assured of 100% quality and reliability. Also, learn to store your baby bibs properly as they could still be useful in the future if you happen to have other babies. Even if you don’t, you may have family members who will need them; you can even set it up for sale at a giveaway price and get yourself a few cents. If you don’t store them properly, they may end up damaged and become no longer useful.